Rod Shelton: What size should a Facebook Event picture be? 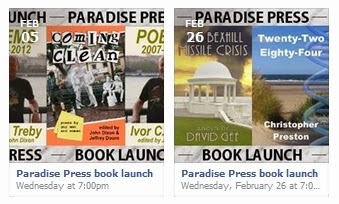 I recently set up two facebook events for Paradise Press book launches. In doing so I discovered they have CHANGED the dimensions for the picture you can upload for your facebook event. Googling around, I first found a page from facebook saying the image should be 850 × 315 pixels. Then another from someone else saying it should really be 714 × 264 and that if you used the size facebook advised it would be cropped. I used the 714 × 264 size and all was well. BUT … there is ALWAYS a BUT … facebook said they used the middle bit only for the square picture they use in your events list. In my case, they used a portion over to the right of centre, centred on ONE of the book images. Looking at a number of other events on facebook it seems they are using some sort of image recognition routine to identify the most ‘interesting’ part of the image. Some used the central part, some began from the left hand edge of the image and some like mine over to the right. As you can see the picture is indeed a square selection from the image, but one is centred on the original image and the other is centred on just one of the book covers. Luckily, by making my text fit into the 264 px width it is all included in both cases, and I would recommend this approach, given that you can’t guarantee with absolute certainty which bit of the image will be selected by facebook. When I posted the events on Facebook, back in February, there was a ‘letterbox’ version of the event picture used by facebook. This seems to have completely disappeared. I certainly can’t find it any more. For the record I am leaving the rest of my original post intact, although it seems no longer to be relvant/current. Hopefully this helps anyone wanting to get their event image ‘right’. Please bear in mind that the pixel dimensions along the left hand side of the schematic are based on my calculations and might be a few pixels out. Also don’t forget that the piece used for the event photo might be over to the right or left, rather than centred.